Founded in July, 2007, Haida is located in the most developed Yangtze River Delta in China―Huashi Town in Jiangyin, close to Shnghai-Nanjing Freeway, Freeway along the Yangtze River and close to Xinyi―Changxin Freeway. It is not more than 500m away from the “Huaxi” and “Huashi” Exist of the Freeway along the Yangtze River. It is separated only by a road with the famous village―Huaxi Village. Occupying 380,000m2，its total registered capital reaches RMB360million. There are over 2600 employees at present. This group company owns 6 subordinate branches including Jiangyin Litai Decorative Material Co.,Ltd (Singapore listed company), Jiangyin Haida Decorative Material Co.,Ltd, Jiangyin Haida Color Coating Co.,Ltd, Jiangyin Comat Metal Products Co.,Ltd, Jiangyin Huayou Decorative Material Co.,Ltd and Jiangyin Haida Special Artifical Leather Co.,Ltd.. The total saleroom reached RMB1.59billion in 2006 and there was＄19.5million for export. Litai has owned the capacity of producing 800,000sq.m. “Haida” fluorine-carbon aluminum single sheets, and the capacity of producing 6,500,000s q.m. aluminum-plastic composite sheets, aluminum-plastic composite fireproof sheets, chameleonic sheets, art grain sheets, wood grain sheets, granite grain sheets, antistatic dustproof sheets and antibacterial sheets. 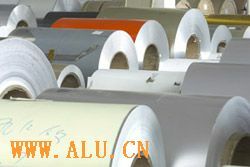 As one of the famous and leading manufacturers for aluminum-plastic sheet in China, our products are widely used in each basic construction for business, industry, home construction and material providers, etc..
Donghua Aluminum Material Technology can produce more than 50,000 tons various aluminum shaped materials using in construction and industry. It has developed as the largest production base in East China integrated with casting, dies, extrusion, oxidation and electrophoresis, static powder coating, fluorine-carbon spraying and heat-insulation cold bridge shaped material. Owning ten sets of the most advanced revisable cold rolling mills, precision slitters made in Taiwan, eveners and cooperative equipments, and one tinning production line, Comat Metal Products Co.,Ltd is specialized in various bright flat steels, precision strip steels, tinning rolled sheets and so on. These products may be used widely in automobile, container, metal furniture, doors and windows, mechanical hardware and engineering machinery, etc. Haida Artifical Leather Corporation has formed certain production scale with 55,000,000 square meters of clothing leather, PU leather, waterproof leather and frothing leather every year. It is hopeful to meet demands for special top-grade artifical leather in the industry of foreign and domestic clothes, shoes making, box and case, automobile decoration and so on. Having developed quickly for many years, the company has obtained so many honors, such as star enterprise, cultural unit, hundred-strong industry, hundred-excellent enterprise, ten-excellent science & technology enterprise and AAA enterprise. It was honored as “High-tech Enterprise of Wuxi”, “High-tech Enterprise of Jiangsu” in 2002; honored as “AAA Contract-keeping & Credit-respecting Enterprise” by Jiangsu People’s Government in Nov., 2003; honored as “Reliable Enterprise of Jiangsu” by Jiangsu Bureau of Quality and Technical Supervision in 2005; honored as “High-tech Product of Wuxi”, “Famous Brand Product of Wuxi” in 2001; honored as “”Famous Brand Product of Jiangsu”, “High-tech Product of Jiangsu” in 2002; honored as “Trust-worthy Product of Jiangsu”, “Famous Brand of Jiangsu” between 2003 and 2005; and also honored as “Famous Brand Product of China” in 2006. In the same year, “Haida’’ series aluminum-plastic composite sheet and aluminum alloy construction shaped material were honored as “National Inspection-free Product”. Therefore, “Haida” product has been better appraised by broad users, and has greatly cried up by many experts and engineers in construction. Presently, our sales network has been all over the whole country and our products are also exported to Mid East, Mid Asia, Europe and other areas. The company has primarily formed certain industry chain for the new-type construction material including aluminum shaped material, aluminum-plastic sheet and aluminum single sheet, as well as has corresponds to the large scale strip steel, which is to serve Chinese real estate in common to improve the industry of new type construction material!